The prize, to be given biennially by the Camille and Henry Dreyfus Foundation, recognizes exceptional and original research in a selected area of chemistry that has advanced the field in major ways. 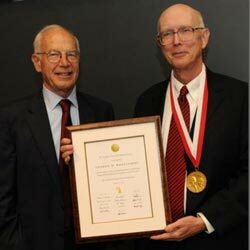 Conferred this year in materials chemistry, the prize consists of a monetary award of $250,000 — one of the largest awards dedicated to the chemical sciences in the United States — a citation, and a medal. The award ceremony will take place at Harvard on Sept. 30, and will include a lecture by Whitesides. Whitesides has had a major and sustained impact in the chemical sciences and materials chemistry. He is one of the most innovative and prolific chemists of our time and the most highly cited living chemist in the world. He has developed powerful methods for the creation of new materials that have significantly advanced the field of chemistry and its societal benefits. His research extends across multiple disciplines, centered on chemistry, but touching biochemistry, drug design, and materials science. His work extends to the engineering of functional systems and the applications of these systems in areas ranging from biology to microelectronics. He has opened broad new technological avenues and has impacted human health in significant ways. Whitesides’ research in materials chemistry has become an essential part of materials synthesis programs around the world. Among Whitesides’ many innovations are the synthesis and molecular organization of new classes of materials, pioneering self-assembled monolayers and microfluidic systems to enable the development of new drugs and extend soft materials into the world of three-dimensional microelectronics, and into consumer devices such as solar cells. Within this work he developed soft lithography, a set of methods for printing and molding organic-based substances to make complex patterns at the micron and nanometer level. Whitesides combined these approaches for creating materials with the concept of polyvalency and developed a new paradigm for drug design. This has resulted in affordable medical diagnostics expected to have a major impact on health in the Third World as well as new drugs that manage cholesterol, improve dialysis, and combat multiple-drug-resistant pathogens.